STAGE EIGHT This stage has now been lodged at the Titles Office. 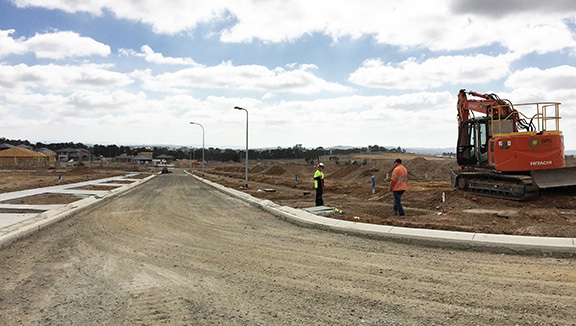 STAGE TEN Sewer and waterworks, road boxing, drainage and retaining walls are complete. Electrical and communications install are nearing completion. Footpath works have commenced and asphalt will be laid in May. Construction is on track for settlements to occur in June 2018. 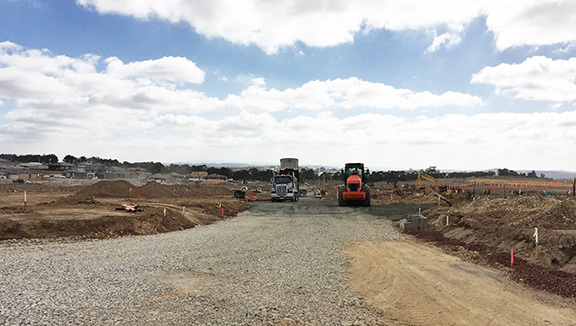 STAGE ELEVEN Road boxing, drainage, sewer works and retaining walls are complete, and water works have commenced. Electrical and communications installation will commence in April. Footpath works have commenced and asphalt will be laid in May. Construction is on track for settlements to occur in June 2018. STAGE TWELVE Preliminary Earthwork and Sewer works have commenced. Drainage, Road boxing and will commence in April, followed by watermain installation in May. Construction is on track for lodgement at the Titles Office in August 2018. STAGE THIRTEEN Preliminary Earthwork are scheduled to commence in May, and construction completion is anticipated to occur in September 2018.